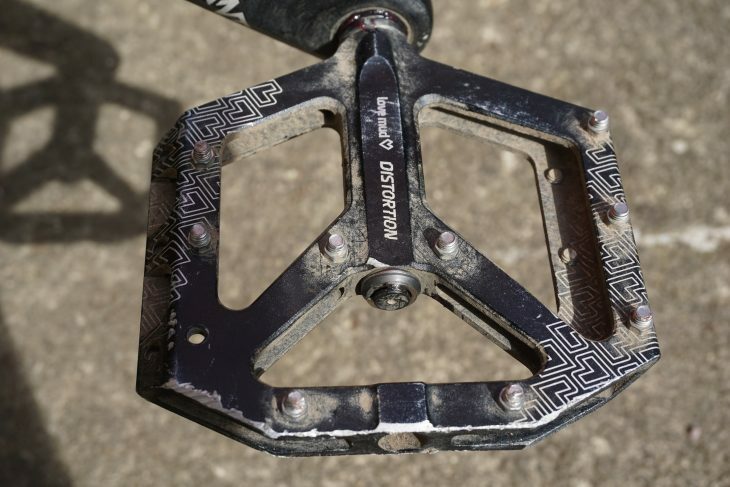 Our resident bargain hunter, Antony, has been testing out a set of flat pedals from UK-brand Love Mud. The Distortion pedals are great value on paper, but are they any good? Over to Antony for the review! There’s a dilemma with pedals. They’re a part of your bike that you’re in constant contact with, so a sub standard pair can really ruin your ride. 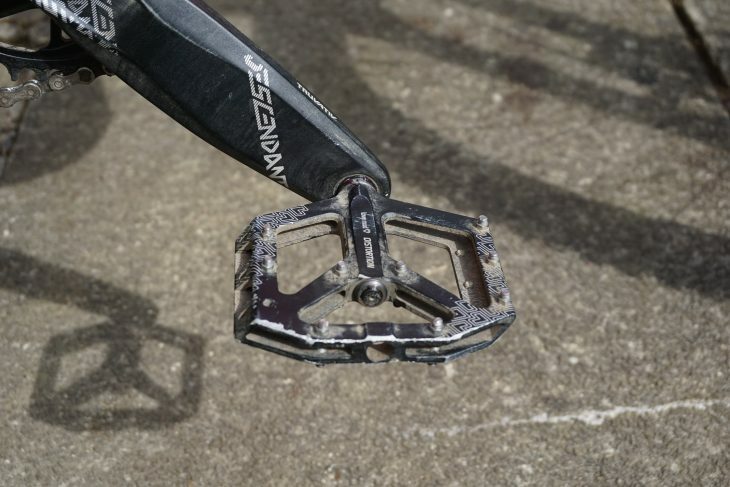 And you really don’t want your pedals to give up on you, given that you need them for forward propulsion. Yet pedals are also very much in harm’s way, and I definitely clatter mine on rocks more than any other bit of my bike. So while part of me pines for pedals that are as posh as possible, the pedal pragmatist in me knows that this isn’t always practical. 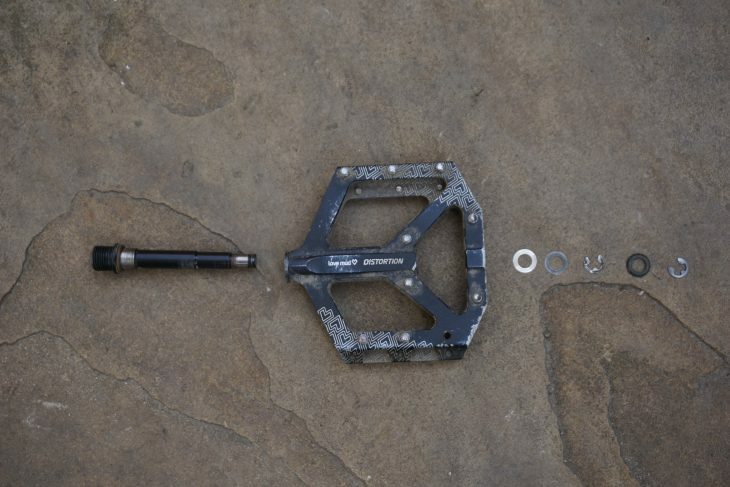 The Love Mud Distortion pedals, like most of parent company Alpkit’s products, are pitched firmly at this sweet spot between budget and bling. 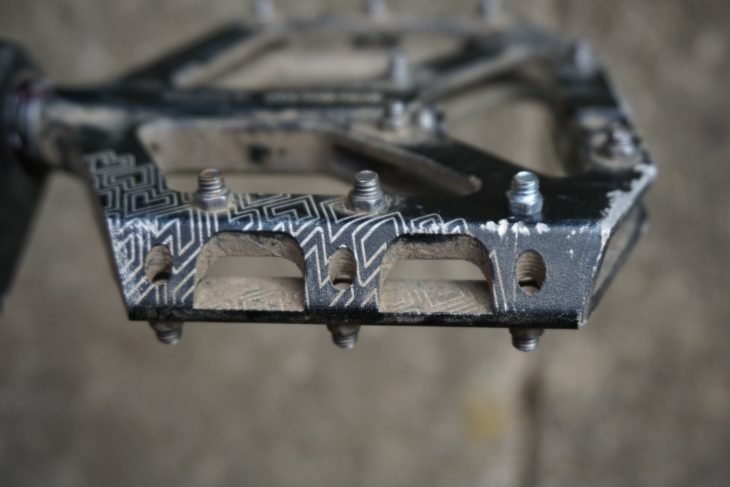 You can easily spend twice as much on a set of flats, but with a full alloy body and plastic bushings instead of bearings, they promise better strength and feel than a set of el-cheapo pedals with thick plastic bodies. 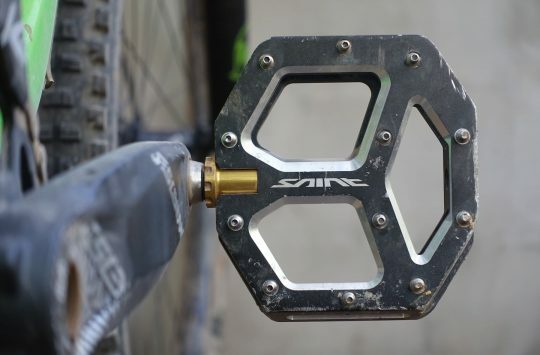 At 170g each, and measuring a smidge under 14mm at their thickest part, the Distortions have the low weight and profile of much pricier pedals. The black anodised bodies sport laser-etched graphics that are a particularly good match for SRAM’s range of cranks – a smart move given that Alpkit’s Sonder bikes come specced with said parts. The subtle graphics complement SRAM’s stable of components. 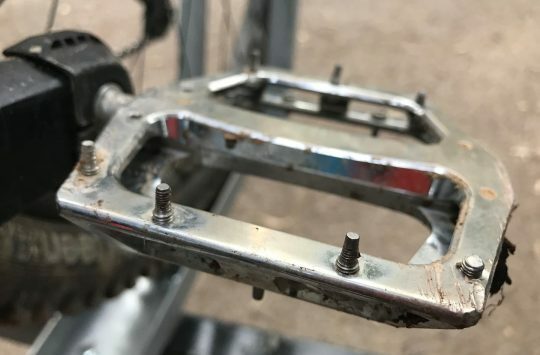 There are ten stainless steel pins per side, which screw in from the outside of the pedal, and are reversible to provide an extra 2mm of sole-stabbing grip. I started off testing the pedals with the pins in short mode, and never felt the need to try the long setting (thank you Five Tens), but if you use shoes with a heavily textured sole, the option of longer pins might come in handy. The pedals come with no less than ten spare pins, as well as a small tool, akin to a radiator key, to fit them. However, after the first ride I was starting to wonder if this would be enough, as I managed to leave several pins somewhere on the trail. This pattern continued for the next few rides, until I threw caution and torque settings to the wind and tightened them up as much as I could. 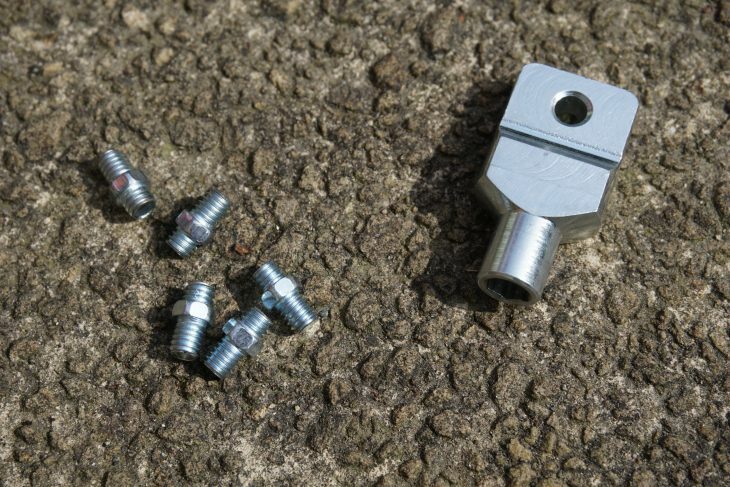 It turns out Alpkit actually ship the pedals with a bottle of threadlock, which didn’t arrive with our test set, but a blob of this on the base of each pin should avoid this problem. Plenty of spare pins, just remember the threadlock. Happily, in use the pedals feel just fine. The platforms aren’t anything like the biggest out there, but thanks to their concave shape they do a great job of keeping your feet in place. The low profile and heavily chamfered edges also make it less likely you’ll catch them on a rock or the edge of a rut. Grip was good and I didn’t find myself pining for a larger platform, even on long rides. They’ve picked up a few battle scars, but even after a few months of bashing them into protruding bits of geology, there have been no catastrophic issues. The chamfered edges shrug off the hits. Externally, then, all is dandy, but what’s happening on the inside? Pedals use either bearings, bushings, or a mix of the two. The Distortions run entirely on Igus bushings, which are the simplest things imaginable – basically, each pedal body has a couple of tough plastic inserts that stay in contact with the axle. Fans of bushings point to their strength and durability, but there’s no denying that they make the pedals spin a bit less freely than proper bearings. Whether this will annoy you depends on the type of rider you are. If you’ve removed every other freehub pawl or disc rotor bolt in a quest for maximum efficiency, you won’t like this aspect of the pedals. But then if you’re that sort of rider, you probably won’t be running flats. Maintaining the Distortions is extremely simple. The pedals are held onto the axles by two small circlips. Find your smallest screwdriver (or even a ballpoint pen), pop the clips and washers off (carefully, unless you want to spend the next hour hunting for them on the garage floor), and the pedal body slides off the axle ready for a clean and a bit of dry lube (Igus don’t recommend using grease). It’s a 5 minute job, if that. I’d guess that the Distortions have a shorter maintenance interval than some pedals, but it’s also much easier than replacing a cartridge bearing. As you might infer from the above paragraph, the Distortions require a bit of looking after. If they’re immersed repeatedly in silty puddles they have a tendency to start squeaking, and you’ll need to whip the bodies off and give them a clean and lube. Sadly, after a few hundred miles, the pedals are also starting to develop some noticeable play. It’s only a couple of mm and it’s not annoying in use, plus there’s a rubber O-ring at the crank end of the axle that should mask any rattling. They also come backed up with a three-year warranty, so you’ll be looked after if they wear out before then. However, spare bushings don’t seem to be available, so if you’d rather rebuild than recycle then you’re out of luck. The Distortions are a great pedal – light, grippy, tastefully understated, and won’t blow a huge hole in your wallet. If you’re not intending to do mega miles on them, and remember to threadlock the pins, these are a decent quality set of flats that feel like they should cost a lot more. However I did manage to put a fair bit of wear on the bushings in my test set in a relatively short amount of time. 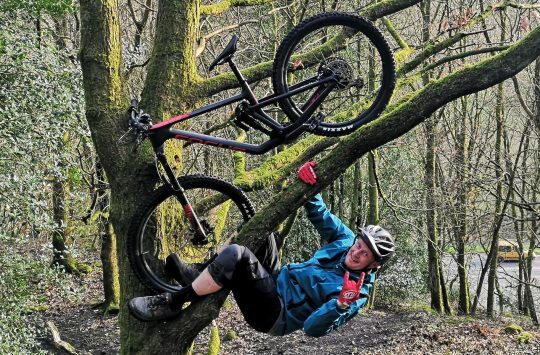 Ideally I’d like Alpkit to start offering a service kit for them, but hopefully riders will be looked after under their warranty scheme if they die before their time. They also do thermoplastic pedals identical in shape to carboncycles ones, that are slightly bigger than the Distortions.